Summer is almost over, and to be honest, it’s something of a relief. We’ve had an unusual number of very hot days (several of 36° or more, which is hot for the highlands) and it’s been incredibly dry. My new lawn has turned an unhealthy looking shade of brown, despite an occasional watering from me, and everything else is looking decidedly thirsty. We’re currently growing a crop of green-manure in the new veggie garden plots, in an effort to improve the soil, so we’re still reliant on our original little veggie garden for greens in the kitchen. 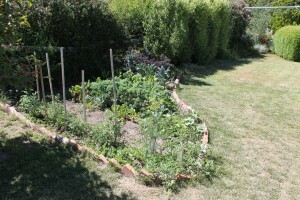 As with previous years, the beetroot, kale and lettuces are doing well. Also as with previous years, the cucumbers are rotting and the tomato bushes are very small (although producing lots of fruit). 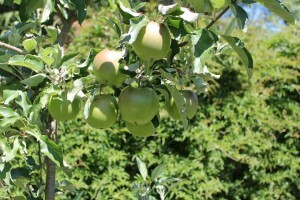 One of our young apple trees has been going along gangbusters. We’re holding out for most of the fruit to fully rippen, but we’ve already had a couple of the apples, which have been tart, but good. The local Currawongs have also developed a taste for them, but fortunately their beaks only seem to be able to get purchase on the ones that are already damaged. 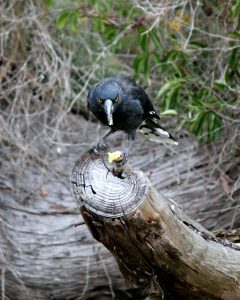 A Currawong, helping itself to a piece of apple from our tree. Also, a couple of weeks ago I put out a basin of water for the birds, and now a rather large frog has decided to move in. He’s out there most days; body floating limp, with his two bulbous eyes just above the surface. 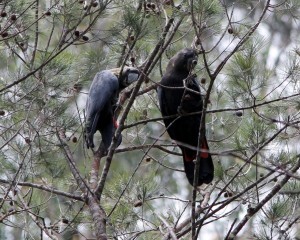 We often go to the fabulous national park at Fitzroy Falls, but this time I thought to take my camera along. 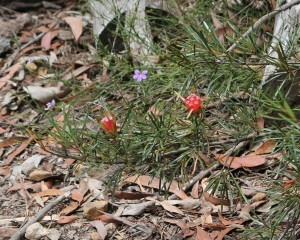 Not only did we see several black cockatoos and a whole bunch of smaller birds, but the place was also filled with beautiful little red flowers, which I now know to be Lambertia formosas (commonly known as Mountain Devils). I am super keen to track some of these down as an addition to the native strip in our garden. 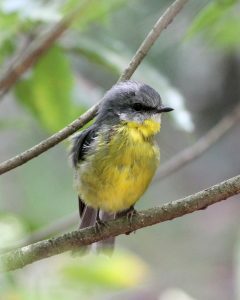 I had actually taken my camera along in the hope of spotting the amazing Lyrebird that had been singing up a storm and generally showing off on our previous two visits, but unfortunately this time he was nowhere to be seen.